LED lights on reclaimed Blackpool Illuminations sign, spot-lights, people walking past. Commissioned by The Grundy for the Illuminations Festival, Blackpool, UK. For her commission with The Grundy Gallery and the Illuminations Festival 2012, Laurence Payot worked with a team of young people to create a new sign. 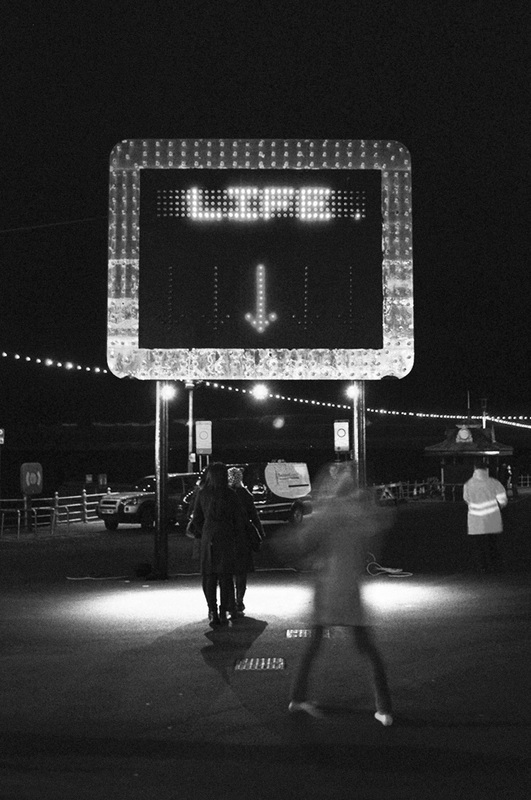 The works’ understated appearance merged with the city’s landscape, re-arranging words and sentences found on the street signs of Blackpool to give them new meanings. The resulting work does not only stand as an object to be read, but also actively invites people to take actions underneath it, where they can stand in the spot-light, pose, dream, ask questions about life, or wait for enough people to gather and have a groups hug.